Hello, and welcome to the December stamp of the month blog hop! 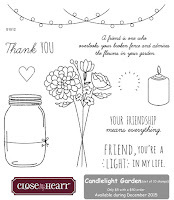 This month's stamp set is Candlelight Garden, 10 stamps just made for sharing. If you've arrived here from Lela Norris' blog, or if you're just starting out, you're in the right place. Just continue hopping along until you end up back where you started. This stamp set totally lends itself to coloring. Since I finally got a set of our watercolors I decided to do two simple cards, and compare the differences between my tried-and-true alcohol markers and the watercolors. It's strange, but I actually colored both images before I even thought about paper colors. I just used colors I thought I would see in nature, and Kaleidoscope papers look great! The image on the left is colored with alcohol markers. (I used Copics, but you will get similar results with our Shin Han Twin Touch markers.) The image on the right was colored with watercolors on watercolor paper. The watercolors give a much more "casual" look to your colors, especially if you work them very wet. They are a very value priced coloring option, and can achieve a wide range of values. A heat embossing gun makes quick work of drying the paints, but adding more water makes them workable again. If you're ready to shop for the items I used, I have a picture list below. The links open in a new window so you don't lose your place in the hop. If you're ready to move along, let's head over to Brenda Lapp's blog and see what she created this month. 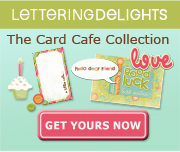 Gorgeous cards- I especially love the second card with the watercolouring and that gorgeous paper pattern! Perfect papers for your lovely cards! Beautiful- I really like the watercolored one. Really like the "softness" of your watercolor card.